Bill Martin is one of the UK’s most acclaimed songwriters. He has been awarded 5 Ivor Novellos, including one as Songwriter Of The Year. In June 2014 Bill received the MBE in the Queen’s Birthday Honour List for Services to Music and Charity in Scotland. 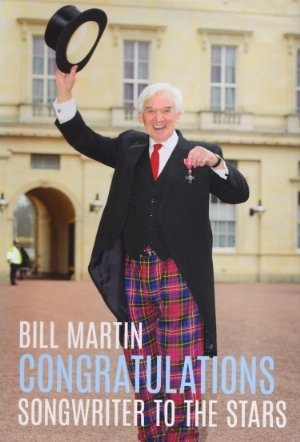 Bill Martin published his autobiography last summer and the first print run sold out! Copies are now back in stock. In this new book, Bill recalls his upbringing in Govan, Glasgow, going to school with a young Alex Ferguson, playing football in South Africa before finding Tin Pan Alley and writing Number One hits for Sandie Shaw, Cliff, Elvis, The Bay City Rollers and many more. In November 2012 Bill was presented with the prestigious Living Legend award at the annual Tartan Clefs which celebrates Scotsmen and women who have made an outstanding contribution to music. Read more here. 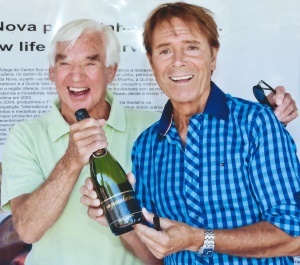 Pictured left: Bill at the launch of Cliff Richard’s new sparking wine Congratulations. Bill Martin was the first British Songwriter to write a Eurovision Song Contest winner for the UK with “Puppet On A String”. Only Scottish Songwriter to write four UK Number 1’s for four different acts. First British Songwriter to write a UK Number 1 football song “Back Home” by The England World Cup Squad in 1970. First British songwriter to win the Eurovision Song Contest with his song “Puppet on a String” and as a Music Publisher with “All Kinds of Everything”. One of the few British Songwriters to have Number 1’s in every country in the world – Europe, Russia, India, Japan, Australia, USA and Canada. Only Scottish Songwriter to write, produce and publish the Scottish band The Bay City Rollers and to have Number 1’s in every country of the world with this group. One of a handful of British songwriters to receive the Prestigious “Silver Heart” from The Variety Club of Great Britain for his services to Charity. The first British Songwriter to have his own radio programme for two years interviewing stars from Dennis Law to Henry Mancini to Sir Matt Busby. Only Scottish Songwriter to be an original member of the SODS – Society Of Distinguished Songwriters – and the only Scotsman to be elected King Sod three times. In May 2011 Sir Jackie Stewart presented Bill with the Great Scot Lifetime Achievement Award at the Johnnie Walker Blue Label Great Scot Awards. Above he is pictured at the award ceremony at Boisdale Restaurant at Canary Wharf with Annie Lennox who received a Great Scot Award for Charity. On the 7th February 2011 Bill was honoured to be inducted into his old school Govan High’s Inaugural Hall of Fame. In the photo above he is joined by Headmaster Iain White and Sir Alex Ferguson CBE. Sir Alex and Bill were inducted with four other old boys.